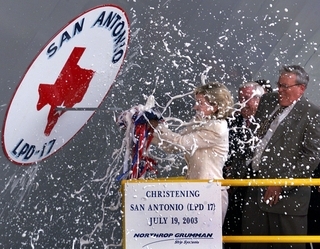 NEW ORLEANS, July 22, 2003 (PRIMEZONE) -- Northrop Grumman Corporation's (NYSE:NOC) Ship Systems sector christened LPD 17 San Antonio on Saturday, July 19, 2003, at the company's Avondale operations near New Orleans. Hundreds of guests and employees attended the traditional dockside ceremony. The San Antonio is first of 12 in a new class of amphibious transport dock ships being built for the U.S. Navy by Northrop Grumman. "San Antonio is the most advanced amphibious ship ever built," said, Gen. Michael W. Hagee, commandant of the U.S. Marines Corps, during the principal address at the ceremony. "It represents the culmination of many years of development and is the first of a ship class that will take our Navy and Marine Corps team, as well as the nation, far into the 21st century." The 684-foot, 25,000-ton ship is named in honor of the city of San Antonio. The ship's sponsor was U.S. Senator Kay Bailey Hutchison from Texas who christened the vessel. "The spirit, the gloried past, and the stubborn courage of the Alamo will sail inside San Antonio and every ship in the class," said Hutchison. "For the San Antonio and its crew, we know they will serve with the same distinction that their forbearers did and the fight for freedom will never be lost." Currently, the ship is more than 75 percent complete. Crews will now begin to outfit the bridge, fire-control room, living spaces, and start powering up the ship's systems. San Antonio will be commissioned for U.S. Atlantic Fleet duty in 2005, will be home ported in Norfolk, Va., will have a crew of 361 and can transport up to 800 Marines. As the first ship designed for the 21st century "Mobility Triad," the mission of LPD 17 class ships is to embark, transport and land elements of a Marine force in an assault by helicopters, landing craft or advanced amphibious vehicles in order to conduct any type of mission. Ship Systems' Gulfport and Tallulah operations also supplied major components and large assemblies for the ship. "We're bringing all of Northrop Grumman's technologies to bear on San Antonio," said Dr. Ronald D. Sugar, chief executive officer and president of Northrop Grumman Corporation. "We're seeing a stunning preview of what is possible when the full talents and capabilities of Northrop Grumman are applied to the special challenges of shipbuilding." The LPD 17 amphibious transport dock ships will be the functional replacement for 36 Navy ships in the LPD 4, LSD 36, LKA 113 and LST 1179 classes of amphibious ships. As prime contractor for the LPD 17 program, Northrop Grumman Ships Systems leads a team comprised of Raytheon Electronic Systems, Intergraph Corporation and vendors in 36 states. Northrop Grumman is building three additional LPDs and will provide advanced equipment for two additional ships. Northrop Grumman Ship Systems includes primary operations in New Orleans and Tallulah, La., and Pascagoula and Gulfport, Miss., as well as in a network of fleet support offices in the U.S. and Japan. Ship Systems, which employs more than 17,000 shipbuilding professionals, is one of the nation's leading full-service systems companies for the design, engineering, construction and life cycle support of major surface ships for the U.S. Navy, U.S. Coast Guard and international navies, and for commercial vessels of all types.